Mme Soucaret, Paris; sale, Galerie Georges Petit, Paris, 5 May 1905, lot 16 (illustrated in catalogue; FFr3,500). M. Didier, Paris, by whom acquired at the above sale. Galerie Georges Petit, Paris (no. 3775). Galerie Bernheim-Jeune, Paris (no. 21780), by whom acquired from the above on 14 November 1919. Alex Reid, Glasgow, by whom acquired from the above on 4 December 1919. Anon. sale, Sotheby's, London, 4 July 1979, lot 309. Anon. sale, Christie's, London, 3 April 1989, lot 2. G. Jean-Aubry, Eugène Boudin d'apres des documents inédits, Paris, 1922 (illustrated, opp. p. 80). R. Schmit, Eugène Boudin 1824-1898, vol. I, Paris, 1973, no. 977 (illustrated, p. 347). 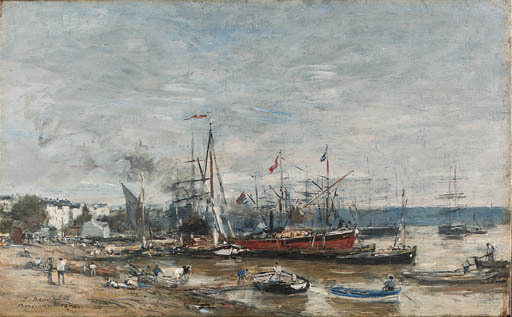 London, Marlborough Fine Art Ltd., Eugène Boudin - In aid of The Artists' General Benevolent Institution, Nov.-Dec. 1958, no. 26.